What color should your band t-shirts be? My friends at the graphic design team Chicken 3000 created a new t-shirt design for me last week. They knew it was going to a be a single color printing, but I hadn’t yet made up my mind about the colors of the ink or t-shirt when I asked them to create the design – so they made a kind of minimal logo that would work no matter what colors I chose. Once they sent me the file, I had to start making some decisions: aqua blue on orange? Light gray on dark gray? Blue on brown? The options were wide open. After doing some Google searches, consulting the merch stores of some of my favorite bands, and surfing Pinterest boards, I thought I was leaning towards one of those three color combinations I just mentioned above, BUT THEN I had a conversation with Kevin Breuner, CD Baby’s VP of Marketing. Kevin has moved quite a few t-shirts in his time with the band Smalltown Poets, and they’ve sold a number of different designs throughout their career. His advice: go with a black or white t-shirt, because that’s what sells the most. I did a little more research online, and also wrote the head of Merch.ly for his advice. It wasn’t difficult to gather evidence supporting Kevin’s point. Most t-shirt manufacturers claim that the bulk of the t-shirts their clients order are either black or white. Gray is a distant third, and then even further in the distance are navy blue and red. Does it stand to reason that if those are the colors bands are ordering, that’s what fans are buying? Maybe. Or maybe black or white t-shirts are more attractive to bands because they’re standard, which usually means cheaper to order. Either way, I just couldn’t bring myself to order a white or black t-shirt — so I went with the next safest bet, a lightweight heather gray shirt with black printing, because it looked cool, but it was also muted enough to look good on almost anyone (unlike my original orange+blue idea). So, what are your thoughts? Am I playing it too safe? What color t-shirts do you like to wear? What color t-shirts are most popular with your fans? Let me know in the comments below. If you’re looking to order t-shirts, hoodies, hats, and other band merch, check out Merch.ly today! 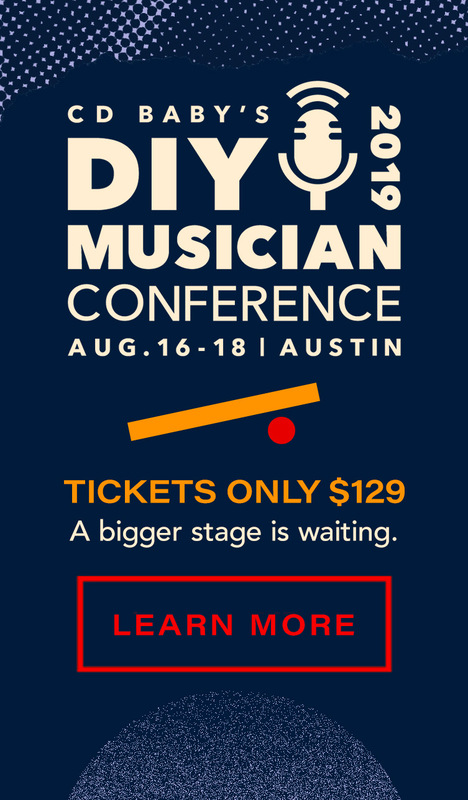 Reason #1 to attend CD Baby's DIY Musician Conference: COMMUNITY!